The Dixon Fuse Series Zebrawood shell pack has been getting a lot of buzz lately, both from industry insiders and curious consumers. We introduced the new kit at Winter NAMM 2017, and the response was overwhelmingly enthusiastic. Now, Dixon Drums has been honored with an Editor’s Choice Award from Music Inc. Magazine for this Zebrawood kit, and we wanted to dig in and tell you a little bit more about the little beauty that has everyone talking. The Dixon Fuse Zebrawood kit is a new, limited-run shell pack featuring an exclusive Dixon-engineered, stunning Zebrawood laminate. Dixon is all about real solutions for real drummers, and Fuse Zebrawood offers the perfect solution for those drummers who have longed for the look of exotic wood shells without the high-end price tag—and the fear of taking them out of the house! 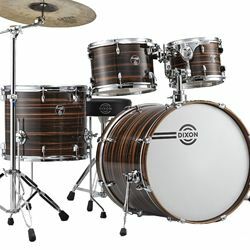 This development takes Dixon’s reputation for beautiful drum finishes a step further, introducing a new process that opens the door to unlimited exotic possibilities at a mid-line price point.